I need help identifying these. Please help. Hi Edina, again, these are Echeveria; from the back, this is Echeveria Curlylocks, one of my all time favorites for the frilly edges and porcelain like leaves which are almost translucent. The other two are new to me; have a look on these pages for some photos for more species and varieties: here and more here. 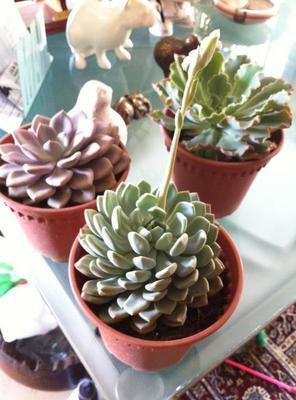 Don't miss the pages here on succulent care and how to grow Echeveria. Best of luck with your expanding collection, you obviously have the perfect conditions for growing these lovely plants where you are. See these pages too: Echeveria hybrids and Echeveria species.